The difference between mean inspiratory and expiratory respiratory reactance (ΔX̄rs) measured with forced oscillation technique (FOT) at 5 Hz allows the detection of expiratory flow limitation (EFL) in chronic obstructive pulmonary disease (COPD) patients breathing spontaneously. This aim of this study was to evaluate whether this approach can be applied to COPD patients during noninvasive pressure support. ΔX̄rs was measured in seven COPD patients subjected to nasal continuous positive airway pressure (CPAP) at 0, 4, 8 and 12 cmH2O in sitting and supine positions. Simultaneous recording of oesophageal pressure and the Mead and Whittenberger (M–W) method provided a reference for scoring each breath as flow-limited (FL), non-flow-limited (NFL) or indeterminate (I). For each patient, six consecutive breaths were analysed for each posture and CPAP level. According to M–W scoring, 47 breaths were FL, 166 NFL and 51 I. EFL scoring using FOT coincided with M–W in 94.8% of the breaths. In the four patients who were FL in at least one condition, ΔX̄rs was reduced with increasing CPAP. These data suggest that the forced oscillation technique may be useful in chronic obstructive pulmonary disease patients on nasal pressure support by identifying continuous positive airway pressure levels that support breathing without increasing lung volume, which in turn increase the work of breathing and reduce muscle effectiveness and efficiency. Dynamic hyperinflation caused by expiratory flow limitation (EFL) has been identified as one of the main causes of dyspnoea in patients with chronic obstructive pulmonary disease (COPD) 1, 2. The increase in a subject's operating volumes at a given ventilatory rate increases the passive pressure load to be overcome by the inspiratory muscles and therefore the work of inspiration. It has been shown in both physiological and clinical studies that the application of nasal ventilatory support and, particularly, positive end-expiratory pressure (PEEP) decreases the inspiratory load at any given volume, and therefore reduces this increase in work load, normalises the pattern of breathing, improves blood gases and reduces patient–ventilator asynchrony 3–5. However, continuous positive airway pressure (CPAP) may have harmful effects on haemodynamics, particularly by increasing intrathoracic pressure in one or more of the phases of the respiratory cycle and thereby reducing venous return 6–8. CPAP may also impair the function of the inspiratory muscles if it increases operating volumes above the levels imposed by EFL; in particular, if operating volumes increase to levels where the respiratory system is stiffer (increased elastance) or where the inspiratory muscles operate at disadvantageously shorter lengths or less favourable mechanical advantage. Any such increase in elastance raises the pressure and workload on the inspiratory muscles, and shorter muscle lengths or less favourable mechanical advantage may decrease their effectiveness and energetic efficiency independently of any increase in workload. The optimised application of end-expiratory pressure would require tailoring the applied pressure value to each individual patient. Specifically, the optimal end-expiratory pressure should be a trade-off between being high enough to avoid EFL and low enough to limit unnecessary patient discomfort, a negative influence on haemodynamics and an increase in lung volume. Such tailoring should take into account the fact that EFL is a condition that may change considerably with time 9, and particularly from night to day, owing to the change in body posture and breathing pattern during sleep. Therefore, a noninvasive tool to continuously assess EFL during application of ventilatory support through a nasal mask would be quite useful. A new noninvasive method to continuously detect EFL has been recently proposed and evaluated in both normals and COPD patients during spontaneous breathing 10. The method is based on measuring the within-breath change in respiratory reactance (Xrs) via a single-frequency forced oscillation at 5 Hz. Given that forced oscillation can be easily applied during noninvasive nasal ventilatory support 11, 12, the method described could be used during routine noninvasive ventilation. The method, and in particular the suitability of the threshold value of reactance change used to detect EFL, has not been evaluated when the patient is subjected to different levels of nasal pressure and with changes in posture. Accordingly, the aim of this study was to evaluate the effectiveness of the forced oscillation technique (FOT) method in detecting EFL in patients with different levels of nasal CPAP in sitting and supine postures. The current authors analysed data from a previous study in which forced oscillations were applied for a different reason from the one in this study 11. To test the sensitivity and specificity of the method, the study was conducted in patients with either COPD or chest wall restrictive diseases. The Mead and Whittenberger (M–W) method, for detecting EFL based on the analysis of the flow and transpulmonary pressure signals, was used as reference 13. The current study was carried out by analysing data collected previously 11, which included 11 patients with severe chronic respiratory disease, seven of which had COPD and four of which had restrictive ventilatory defect due to chest wall diseases (table 1⇓). All the patients were in a stable condition at the time of the study and had avoided bronchodilators for ≥24 h before the measurements. The institutional ethics committee approved the study and written informed consent was obtained from the patients. Patients were studied while receiving CPAP through a nasal mask. 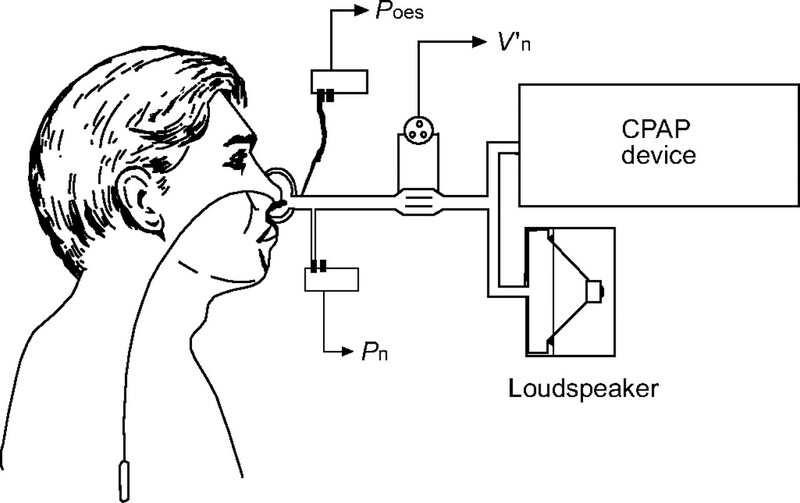 Nasal pressure (Pn) was measured using a pressure transducer (MP-45; ±20 cmH2O; Validyne, Northridge, CA, USA) connected to the mask and nasal flow (V′n) by a Fleisch-type pneumotachograph (resistance of 0.35 cmH2O·s·L−1) and a pressure transducer (MP-45; ±2 cmH2O; Validyne). Oesophageal pressure (Poes) was measured using a transducer (MP-45; ±50 cmH2O; Validyne) connected to a standard balloon-catheter system placed in the lower oesophagus. Its position was tested using the occlusion method 14. Transpulmonary pressure (PL) was defined as PL = Pn–Poes. All the signals were low-pass filtered at 16 Hz by anti-aliasing filters (Butterworth, 8-poles) and sampled at 100 Hz by a data acquisition board (CODAS; DATAQ Instruments Inc., Akron, OH, USA). The patients were studied by applying FOT sinusoidal pressure at the mask (5 Hz, ∼1.5 cmH2O amplitude), generated by a loudspeaker (JBL-800 GTI; JBL, Vitoria, Spain) connected in parallel to a conventional CPAP device (CP90; Taema, Antony, France) (fig. 1⇓). A 2-L chamber closed the rear part of the loudspeaker to withstand continuous positive pressures generated by the CPAP device 15. Experimental set-up for oscillatory impedance measurement during continuous positive airway pressure (CPAP). Poes: oesophageal pressure; V′n: nasal flow; Pn: nasal pressure. Each subject was studied in both the seated and the supine position while receiving CPAP at 0, 4, 8 and 12 cmH2O. Posture and CPAP levels were changed in random order and maintained for ∼10 min to allow patient adaptation. Data were recorded for the duration of the test (∼80 min). Further details on the protocol have been previously published 11. Three COPD patients were unable to either maintain the supine position at the lowest CPAP or to adapt to the CPAP in one or more levels in supine position. Thus, data can only be presented for these subjects in the seated position. The semi-recumbent positions were not studied. For each patient and measuring condition, the latest six consecutive breaths were selected where the breathing pattern was stable with no swallowing, oesophageal spasms or other transient reflexes, according to flow, Poes and impedance recordings. All six breaths were analysed using both FOT and M–W. Within-breath Xrs was computed for each breath, from Pn and V′n, as previously described 10. The mean values of Xrs during inspiration (X̄insp) and expiration (X̄exp) were computed. Their difference (ΔX̄rs = X̄insp–X̄exp) was used to detect EFL. A breath was considered flow-limited (FL) if ΔX̄rs was greater than a threshold of 2.8 cmH2O·s·L−1, a value that in the current authors' previous study 10 was able to identify FL breaths with 100% sensitivity and specificity compared to M–W. The study's reference for the detection of EFL breath-by-breath during tidal ventilation was based on the M–W method 13 of measuring pulmonary resistance. Briefly, the flow-resistive pressure drop (Pfr) was estimated by subtracting the elastic recoil pressure of the lung from the Pl. When the Pfr–V′n plot showed a loop during the expiration where flow decreased during expiration while Pfr increased, the breath was classified as FL; if the expiratory phase was characterised by a quasi-linear dependence between Pfr and flow with little or no loop, the breath was classified as non-FL 10. When the inspiratory pressure–flow curve was looped (possible errors in elastic recoil pressure estimation) or when the expiratory pressure–flow curve showed a loop characterised by a phase in which flow decreased but Pfr did not simultaneously increase, the breath was classified as indeterminate (I). Examples of FL, non-FL and I breaths are reported in figure 2⇓. Examples of breath classification using the Mead and Whittenberger graphs. a) Non-flow-limited and b) flow-limited breaths. c and d) Examples of breaths classified as indeterminate because expiration showed a loop characterised by a phase in which flow decreased but the flow-resistive pressure drop (Pfr) did not simultaneously increase (c) or because the graphs showed an opening of the inspiratory loop suggesting that the estimation of the elastic recoil pressure of the lung was not correct (d). Experimental tracings for a representative COPD patient in the supine position are shown in figure 3⇓. In this subject, Xrs showed an inspiratory mean value that was similar for all CPAP levels. Conversely, during expiration, Xrs reached much more negative values at CPAP 0 cmH2O than in all the other CPAP levels, suggesting that EFL was present only in this condition. For all the breaths at CPAP 0 cmH2O, the values of ΔX̄rs were above the threshold for EFL, while at the other CPAP levels it was below the threshold in all except one breath at CPAP 4 cmH2O. The M–W graphs confirmed that this patient was FL only at CPAP 0 cmH2O. 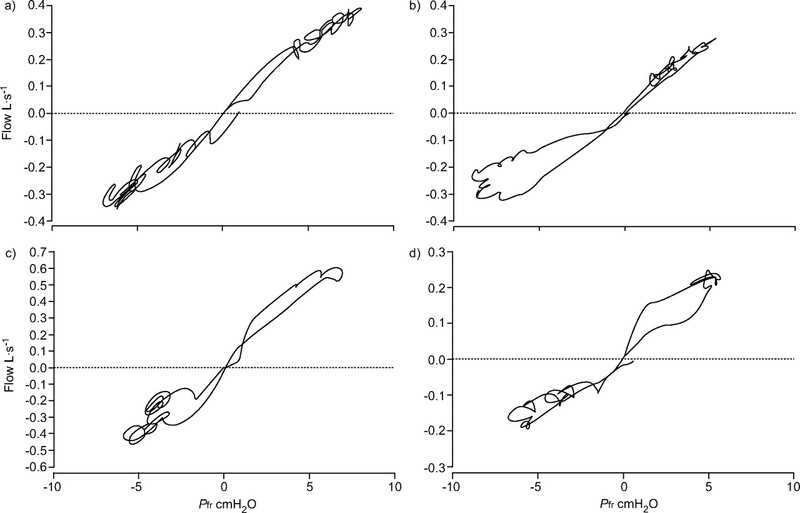 Experimental tracing from a representative patient, showing flow at the nasal mask (V′n; positive when inspiratory), nasal pressure (Pn), oesophageal pressure (Poes), total respiratory input reactance (Xrs) at 5 Hz and the difference between mean inspiratory and mean expiratory reactance ΔX̄rs for each breath at the four considered CPAP values of a) 0, b) 4, c) 8 and d) 12 cmH2O. ···········: threshold for expiratory flow limitation. The average values of X̄insp, X̄exp and ΔX̄rs in the different CPAP levels and postures are reported in table 2⇓. In COPD patients, X̄insp was always less negative than X̄exp, it showed less variability and it was only slightly affected by increasing CPAP. Conversely, X̄exp was more negative and, consequently, ΔX̄rs was greater at CPAP 0 cmH2O than at CPAP 12 cmH2O. They also presented high variability at low CPAP (as indicated by the high sd in table 2⇓), suggesting that some patients were expiratory flow limited at low CPAP levels and that EFL reduced or eradicated increasing CPAP. Restricted patients also showed high variability in X̄insp, mainly at low CPAP levels, where its average value was even greater than X̄exp. The mean value of ΔX̄rs was very small at all CPAP levels for all restricted patients, suggesting an absence of EFL. The breaths classification with the M–W technique in all patients and all conditions is reported in table 3⇓. Altogether, of the 264 studied, 213 breaths from the COPD patients were classified as FL or non-FL. The remaining 51 breaths (19% of the total) were classified as indeterminate according to the criteria discussed in the Methods section. In the COPD patients, the ΔX̄rs index computed from the FOT signal was able to correctly classify 94.8% of the breaths as FL or non-FL, as shown in table 3⇓, providing a sensitivity and specificity of 95% and 98%, respectively. The restricted patients never presented EFL when using the M–W technique. In these patients, 161 of 192 breaths were classified (table 3⇓); three breaths were misclassified as false positive by ΔX̄rs (1.9% of the analysed breaths). In all patients (COPD and restricted), with the exception of one, misclassification was present in a maximum of one of the six selected breaths for each condition. Therefore, the majority of analysed breaths were classified in the same way by the two techniques in all but one case (patient No. 3 at CPAP 4 cmH2O). To evaluate whether the threshold of 2.8 cmH2O·s·L−1 defined in the current authors' previous study was appropriate for the experimental conditions of the present study, the sensitivity and specificity of ΔX̄rs as a function of the threshold value were plotted (fig. 4⇓) and this plot was superimposed over that obtained in the previous study. The two plots are very similar and identify very comparable optimal thresholds (2.8 cmH2O·s·L−1 in the previous study, 2.61 cmH2O·s·L−1 in present study). Sensitivity (the number of detected flow-limited (FL) breaths divided by the total number of FL breaths; – – – and - - - -) and specificity (the number of detected non-flow-limited (non-FL) breaths divided by the total number of non-FL breaths; ––––––– and –– - ––) expressed as a percentage of all the classified breaths are plotted versus the threshold values for the data from mouth impedance (– – – – and –– - ––; data from 10) and for the data from nasal impedance analysed in the present study (––––– and - - - -). ···········: threshold for expiratory flow limitation. 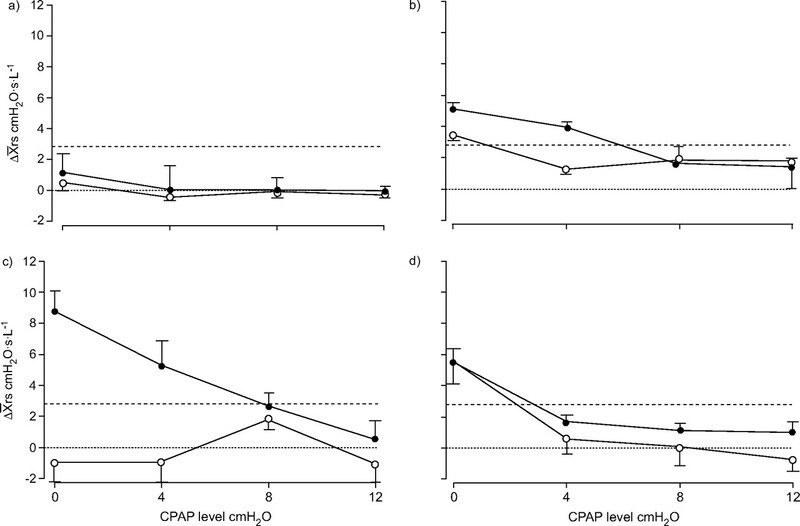 Figure 5⇓ shows the relationship between ΔX̄rs and CPAP level in the four COPD patients that were able to perform the experiment in both sitting and supine postures. In general, ΔX̄rs was higher in the supine than in the sitting position, reflecting the fact that the decrease in elastic recoil in the supine posture promotes the development of EFL in COPD patients 16, 17. When the patients were FL at CPAP 0 cmH2O, the increase in CPAP resulted in a progressive decrease in ΔX̄rs. When the patients were non-FL, increasing CPAP did not modify ΔX̄rs. Mean±sd of the difference in mean inspiratory and expiratory reactance (ΔX̄rs) determined in the group of six consecutive breaths considered for the validation study at each continuous positive airway pressure (CPAP) level, in the seated (○) or in the supine (•) positions of the four chronic obstructive pulmonary disease patients (patient No. 2 (a), patient No. 3 (b)) able to maintain the supine position at all CPAP levels. ------: threshold for expiratory flow limitation. Figure 6⇓ illustrates how the current authors' approach could be used to continuously monitor the development of EFL in clinical practice. The computation of ΔX̄rs for all the breaths in the tracing recorded in a representative patient throughout the whole protocol was performed automatically without manual elimination of swallows or other abnormalities. A filtering procedure was implemented to exclude abnormal impedance measurements. First, outlier breaths with ΔX̄rs >9 or <−1 cmH2O·s·L−1 were rejected, to exclude all the ΔX̄rs measurements not included in the range of values found in the previous study performed in optimal conditions 10. Secondly, a moving average filter with a window of 12 breaths was applied on ΔX̄rs time series. 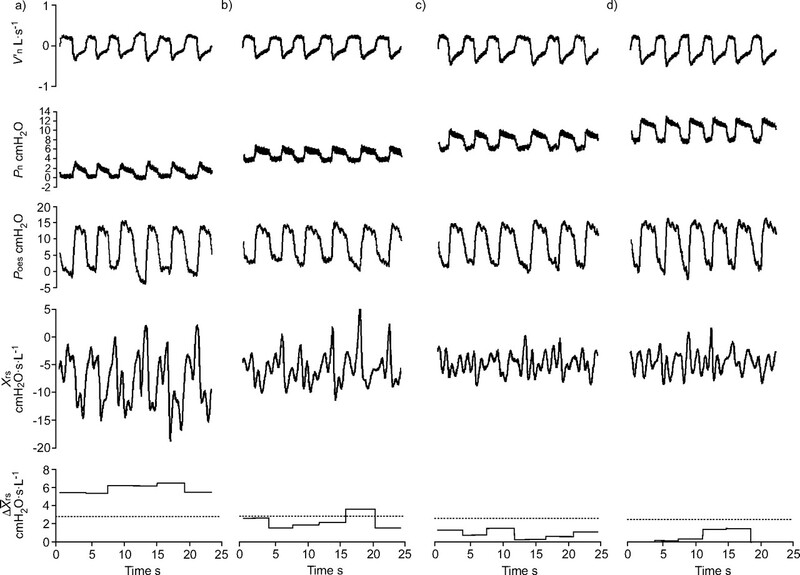 The example in figure 6⇓ shows that the filtered ΔX̄rs signal provides a real-time index of EFL, indicating how EFL is modified by the application of different CPAP values and/or by changing posture. An example of monitoring of expiratory flow limitation (EFL) during the whole protocol in a representative subject (subject No. 3). Nasal pressure tracings (Pn) and the difference in mean inspiratory and expiratory reactance (ΔX̄rs) are shown in the a) supine and b) seated positions. ΔX̄rs data were filtered with a moving average filter using a window of 12 breaths. ···········: threshold for EFL. #: continuous positive airway pressure (CPAP) 4 cmH2O; ¶: CPAP 12 cmH2O; +: CPAP 8 cmH2O; §: CPAP 0 cmH2O. The main purpose of this study was to assess whether the current authors' method of detecting EFL based on FOT is applicable to COPD patients during noninvasive pressure support delivered via a nasal mask. In such conditions, it can be difficult to obtain accurate measurements of patient impedance because of possible leakage around the nasal mask (which constitutes a parallel pathway and affects the measurements of both resistance and reactance) and because of the high patient impedance offered by the nasal pathway (which increases the effects of shunt pathway and reduces the signal/noise ratio of the measurement). For this reason, the sensitivity and specificity of the technique was evaluated in both COPD and restricted patients during CPAP in a typical clinical setting. It was also found that in such conditions, ΔX̄rs provides a robust method for the detection of EFL compared to the invasive M–W, as both sensitivity and specificity were very high (>95%) regardless of the demanding experimental conditions. Figure 4⇑ shows that the sensitivity and specificity values of ΔX̄rs obtained from the previous study 10 are very similar to those obtained in the present study. This confirms that ΔX̄rs is very sensitive to the development of EFL but largely independent from patients' characteristics (anthropometric and spirometric values), experimental conditions (quiet breathing or during CPAP, mouth or nasal impedance), posture (sitting or supine) and equipment, allowing the definition of a unique, constant threshold value. It is also remarkable that the method provides similar results in two studies where patient impedance was considerably different (the impedance in the present COPD patients was on average 14 cmH2O·s·L−1, approximately three times larger than in the previous study 10). As the technique is based on the analysis of within-breath variations of Xrs, a measurement that reflects elastic and inertial mechanical properties of the respiratory system, it was also assessed whether a reduction in static chest wall compliance, such as in restrictive chest wall diseases, may induce false-positive measurements. Four patients with restrictive chest wall diseases were therefore analysed and it was found that the percentage of misclassified breaths was no different from in COPD patients (table 3⇑). In particular, patient No. 10 showed an X̄insp value of <−12 cmH2O·s·L−1 for all CPAP levels, which was much more negative than any X̄insp value from the COPD patients. However, the X̄exp value was of the same order of magnitude, allowing for very small ΔX̄rs values and suggesting the absence of EFL, which was confirmed by M–W analysis. The slightly lower specificity and sensitivity found in the present study (95 and 98%) compared to those in the previous study (100% for both) may be attributed to the presence of a higher level of noise and variability in the Xrs time courses. The previous study was conducted under laboratory conditions, allowing the patient to relax and repeat the measurements if required. By contrast, the data from the present study were obtained from untrained patients in body positions and with CPAP values that were felt to be very uncomfortable in some cases. This resulted in the presence of spikes in the X̄rs tracing that affect the computation of mean inspiratory or mean expiratory values, resulting in ΔX̄rs values that can misclassify the breath, as occurred in the fifth breath at CPAP 4 cmH2O in figure 3⇑. Interestingly, most of the misclassifications were false positive (13 out of 14; table 2⇑) and in all but one case, ΔX̄rs was increased above the threshold because the X̄insp became less negative compared to the previous and following breaths. This supports the hypothesis that false-positive misclassifications are the result of noise in the recorded signals. However, as the majority of the breaths were classified in the same way by FOT and M–W in all but one case (patient No. 3, supine, at CPAP 4 cmH2O), it is possible to automatically exclude abnormal values by considering an average of ≥5–10 consecutive breaths to improve sensitivity and specificity. As shown in figure 6⇑, the use of a very simple moving average filter on ΔX̄rs data provided a very effective tool for real-time monitoring of EFL in a given patient submitted to noninvasive mechanical ventilation. This method also has a physiological basis. The impedance measured by FOT in the absence of EFL reflects the mechanical properties of the whole respiratory system. Conversely, during EFL, the impedance measured by FOT is only a measure of the mechanical properties of airways downstream from the choke points. This is because a change in pressure cannot be transmitted upstream through the choke points and thus only the downstream airways are oscillated 18. It was found that the threshold is independent of subject size and severity of the disease. This suggests that the differences in the mechanical properties of the airways downstream of choke points (measured by total respiratory system input impendence (Zin) during expiration if the patient is FL) versus the mechanical properties of the whole respiratory system (measured by Zin during inspiration) must be much greater than any possible inter-subject variability of airway wall mechanics and location of choke points. The progressive reduction of ΔXrs observed in the FL COPD patients with increasing CPAP values (fig. 5⇑) suggests that ΔX̄rs not only detects EFL but also indirectly quantifies how far a subject is from being non-FL. This hypothesis is supported by the higher values of ΔX̄rs shown by EFL patients in the supine position compared to the sitting position. This may also explain the only case (COPD patient No. 3 in the supine position at CPAP 4 cmH2O) in which the majority of the breaths (five out of six) were misclassified. The authors found that this patient was FL at CPAP 0 cmH2O but not at CPAP 8 cmH2O, with both the M–W and the ΔX̄rs techniques. This suggests that CPAP 4 cmH2O positioned the patient in a condition of transition between FL and non-FL; in this case it is possible that the number of choke points developed during expiration was sufficient to lower ΔX̄rs below the threshold but that few nonchoked pathways were able to slightly increase the expiratory flow by increasing alveolar pressure, keeping the M–W loop substantially closed during the breath. If this was the case, when passing from EFL to non-EFL and vice versa, there could be a short transition phase in which the two methods give different results. However, the present authors' data show that this is unlikely to occur frequently and, moreover, ΔX̄rs indications during this transition phase between EFL and non-EFL might better reflect the overall condition of the lung than M–W. A typical problem encountered when measuring impedance during noninvasive mechanical ventilation is the presence of unavoidable leakages around the nasal mask. These leakages introduce a shunt pathway in parallel with the subject, which affects the measured impedance. A leak with a resistance comparable to that of the respiratory system decreases the magnitude of both the measured resistance and reactance. The higher the respiratory system resistance and reactance, the greater their reduction. The within-breath change in reactance (i.e. ΔX̄rs) is therefore also reduced. In this study, the nasal mask was carefully fitted to the patient and leakages were monitored before starting the experiment. Nevertheless, during recording, it was found that an average leak flow of 35, 66 and 105 mL·s−1 was present at CPAP values 4, 8 and 12 cmH2O, respectively. 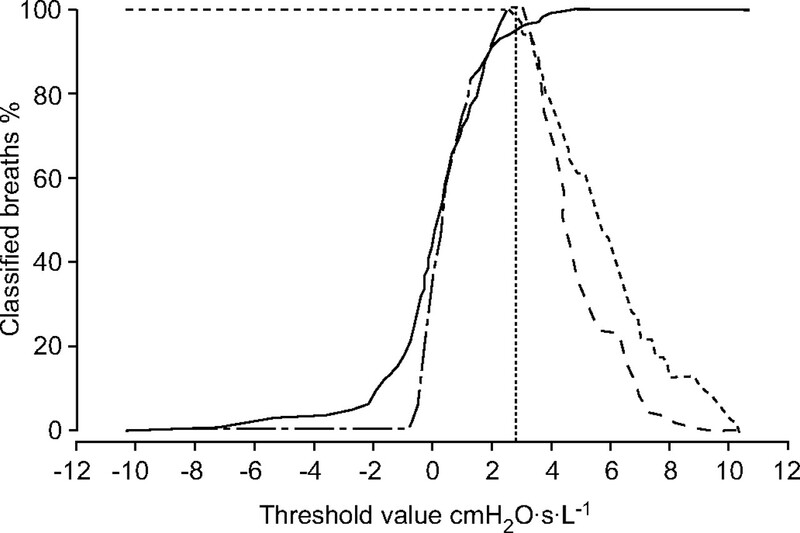 These figures correspond to an average leak resistance of 117 cmH2O·s·L−1, with individual values ranging 45–281 cmH2O·s·L−1, values normally encountered during clinical nasal CPAP treatments 19. In the present study, only one false-negative misclassification out of the 372 analysed breaths was found, suggesting that leakages may have negligible effects on the detection of EFL by FOT. Moreover, as the pneumotachograph can easily measure leakages 20, the presence of abnormally large leaks can be automatically identified, to indicate the possible loss of reliability in detecting EFL. The possible application of the current authors' method is the identification of minimum CPAP or PEEP values required to minimise the development of EFL in mechanically ventilated COPD patients. This information may guide the clinician's choice of CPAP, eliminating unnecessary effects on haemodynamics and impairment of inspiratory muscle function by increasing operating volumes. Moreover, as FOT has already been proved to be very well tolerated by patients when combined with noninvasive mechanical ventilation 21, 22, it may be useful to incorporate this measurement into mechanical ventilators able to continuously optimise the PEEP level to changes in patient posture, conditions, lung volumes and breathing pattern. Identification of expiratory flow limitation with the forced oscillation technique may guide the clinician's choice of continuous positive airway pressure, eliminating unnecessary effects on haemodynamics and impairment of inspiratory muscle function by increasing operating volumes. Marin JM, Carrizo SJ, Gascon M, Sanchez A, Gallego B, Celli BR. Inspiratory capacity, dynamic hyperinflation, breathlessness, and exercise performance during the 6-minute-walk test in chronic obstructive pulmonary disease. Am J Respir Crit Care Med 2001;163:1395–1399. Ranieri VM, Giuliani R, Cinnella G, et al. Physiologic effects of positive end-expiratory pressure in patients with chronic obstructive pulmonary disease during acute ventilatory failure and controlled mechanical ventilation. Am Rev Respir Dis 1993;147:5–13. Baigorri F, de Monte A, Blanch L, et al. Hemodynamic responses to external counterbalancing of auto-positive end-expiratory pressure in mechanically ventilated patients with chronic obstructive pulmonary disease. Crit Care Med 1994;22:1782–1791. Ambrosino N, Nava S, Torbicki A, et al. Haemodynamic effects of pressure support and PEEP ventilation by nasal route in patients with stable chronic obstructive pulmonary disease. Thorax 1993;48:523–528. Patel H, Yang KL. Variability of intrinsic positive end-expiratory pressure in patients receiving mechanical ventilation. Crit Care Med 1995;23:1074–1079. Dellaca RL, Santus P, Aliverti A, et al. Detection of expiratory flow limitation in COPD using the forced oscillation technique. Eur Respir J 2004;23:232–240. Farre R, Gavela E, Rotger M, Ferrer M, Roca J, Navajas D. Noninvasive assessment of respiratory resistance in severe chronic respiratory patients with nasal CPAP. Eur Respir J 2000;15:314–319. Farre R, Mancini M, Rotger M, Ferrer M, Roca J, Navajas D. Oscillatory resistance measured during noninvasive proportional assist ventilation. Am J Respir Crit Care Med 2001;164:790–794. Badia JR, Farre R, Montserrat JM, et al. Forced oscillation technique for the evaluation of severe sleep apnoea/hypopnoea syndrome: a pilot study. Eur Respir J 1998;11:1128–1134. Prinianakis G, Delmastro M, Carlucci A, Ceriana P, Nava S. Effect of varying the pressurisation rate during noninvasive pressure support ventilation. Eur Respir J 2004;23:314–320. Farre R, Rigau J, Montserrat JM, Ballester E, Navajas D. Evaluation of a simplified oscillation technique for assessing airway obstruction in sleep apnoea. Eur Respir J 2001;17:456–461. Randerath WJ, Schraeder O, Galetke W, Feldmeyer F, Ruhle KH. Autoadjusting CPAP therapy based on impedance efficacy, compliance and acceptance. Am J Respir Crit Care Med 2001;163:652–657. Badia JR, Farre R, Rigau J, Uribe ME, Navajas D, Montserrat JM. Forced oscillation measurements do not affect upper airway muscle tone or sleep in clinical studies. Eur Respir J 2001;18:335–339.